They run to gamut from Aauer to Zwickey. Some of them lived long and rewarding lives. Some of them never drew a breath. They served in the Civil War, the Spanish American War, World War I and World War II. Doctors, lawyers, farmers, ranchers, ministers, butchers, saloon keepers. They were born in Germany. In Russia. In Switzerland. In Mexico. In Syria. In Canada. In Sweden. In Denmark. In Ireland. In China. Even in California. Some of them left behind names of distinction and reknown. Some of them were unknown. They are the 14,000-plus men, women and children whose burials in eight of the older cemeteries of one single county — Orange County, California — have been recorded for all time, transcribed, documented as possible… and put onto the web, for all of us to use, free. 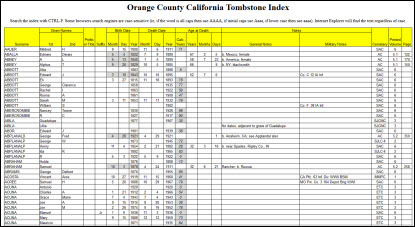 It’s the Orange County California Tombstone Index, a project of the Orange County California Genealogical Society. The cemetery transcription project lists approximately 14,000 persons buried in eight of the older cemeteries in Orange County: Magnolia Memorial Park, St. John’s Lutheran (sections I and II), El Toro, Holy Cross, San Juan Capistrano Mission, Yorba, Anaheim and Santa Ana cemeteries. It began as a volunteer project in the 1960s and continued into the 1980s. The end result was a six-volume series of publications entitled Tombstone Inscriptions published between 1969 and 1983 by the Orange County California Genealogical Society. Five of the six volumes are included in the index; the fourth volume (for the Broadway (Clark) Cemetery in Whittier, Los Angeles County) is digitized on the website and can be searched directly. Not every bit of information in the published volumes is included in the online index — but all the volumes can be downloaded and reviewed for more. And what is there, in the index, is enough to tell us there are stories to be found. The service of Edward Abbott (1843-1895) in Company C of the 12th Iowa Infantry in the Civil War. The service of Charles Edson Waffle (1878-1965) in the Spanish American War. The death of a young Irishman from suicide. The fact that there were two medical doctors who died within a year of each other in 1905-1906 who had the same name: James Gardiner — one born in Scotland and one in Alabama. The sets of twins lost within hours of birth. The dozens of children buried under the name Baby. And the improbable age of 128 years of Henry Ellis when he died in 1945. It’s a terrific resource — and exactly the kind of service to the genealogical community that so many genealogical societies provide. And a great way to find that missing ancestor who headed west, perhaps during the Gold Rush, or perhaps just at the end of a long cold winter. Kudos to the Orange County California Genealogical Society for making this available for all of us to use. Looking forward to visiting with you this weekend. Judy, were you the one looking for information on Ezra Benedict Kellogg who is a War of 1812 veteran buried in Anaheim Cemetery? If so, I have the information on him and his correction to his service record and new military marker. Not me, Shirley — but perhaps whoever it is will see this and I can put you in touch!